Proposed 1.93 million square foot, 15.2-acre mixed-use development featuring 1,344 residential units, 368,070 square feet of office space, a 344-key hotel, and 85,630 square feet of retail and restaurant space, in addition to 1,397 above-and-below-grade parking spaces. The development would replace and incorporate an existing former Edison power plant. Eight new multi-story buildings would be constructed; four buildings would be 170 feet high and taller. Three architecturally-significant former turbine halls that run end-to-end through the site’s center would be rehabilitated and would be the development’s “heart and soul”. Local retail and other amenities would be located on buildings' ground floors. The proposed development would be LEEDv4 sustainability certifiable. Multiple new pedestrian connections would be created between the development and the surrounding streets, creating a new link between South Boston and the Reserved Channel waterfront. 1.15 acres of waterfront public space would be created along the Reserved Channel; the space would celebrate the working port’s heritage. A number of indoor and outdoor spaces would be devoted to the arts, creating an “arts and industry” district for artists and other creative individuals. The project site is located at the corner of First and Summer Streets in South Boston, steps to East Broadway and near Boston's Innovation and Design Building. Downtown Boston and the Seaport District are a short drive or bus ride away. Construction of the proposed development would occur over the next 10 to 15 years. The development’s first phase, which would include demolition of existing buildings, preservation of turbine halls and construction of new housing along East First Street. The industrial power plant site would be fully decommissioned and cleaned. 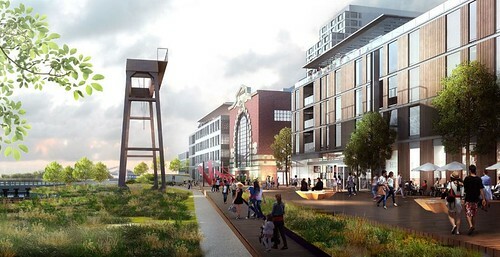 Redgate and Hilco have submitted updated plans to the city for their redevelopment of the South Boston Power Plant site. The new plans call for reduced square footage and building height, along with a more advanced design of pedestrian walkways, and innovative transportation options. The developers will also now preserve the 1898 Building. Total square footage has been reduced from 2.1 million to 1.93 with unit count coming down to 1,344, from 1,588 in the original plan. Building height is also being reduced, the tallest part of the project would now stand at 200 ft instead of 206 ft. The developers are also exploring a partnership with the MBTA to bring supplemental bus service to the area. The proposal calls for a gradual build-out of the project over 12-15 years. Developers Redgate and Hilco Global have revealed detailed plans of the proposed 2.1-million-square-foot South Boston Power Plant redevelopment. In total, 1,588 residential units, 339,639 square feet of office space, a 150-key hotel, and 68,077 square feet of retail and restaurant space, in addition to 987 above-and-below-grade parking spaces, are proposed at the site. Eight new buildings would be constructed at the site, and three existing turbine halls would be rehabilitated; building heights would range from 44 to 220 feet. More information about the latest proposed power plant redevelopment plans is posted above. Plans for the proposed project have been filed with the Boston Planning & Development Agency (BPDA), who is now reviewing the project. 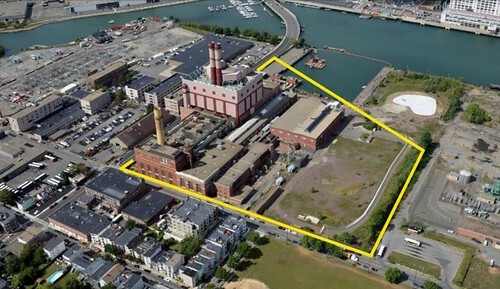 Proponents Redgate and Hilco Global have revealed new details of the upcoming development of the 15.2-acre Edison power plant site on Summer Street in South Boston. In total, per a Letter of Intent filed with the Boston Planning & Development Agency (BPDA), 2.1 million square feet of residential, office, hotel, retail and restaurant space would be developed, along with parking. The proposed development would be constructed over the next 10 to 15 years. The Boston Planning & Development Agency (BPDA) is now reviewing the proposal. Additional information and newly revealed renderings are posted above. The developers have hired SGA as a land planner and Geosyntec as an environmental consultant. One of the primary goals of the developers is to encourage public access to the Boston Harbor waterfront. “We have to find the right balance to connect to the neighborhood and really open up the waterfront that hasn’t been open for the last 100 years,” said Cox. The development team hopes to file formal plans for the South Boston Power Plant project with the Boston Planning & Development Agency (BPDA) in Early 2017. More information about the South Boston Power Plant is posted below. The Boston Globe reports that developers Redgate and Hilco Global are partnering to buy the South Boston Power Plant site. The partners have reached a deal with current owner Exelon Corporation and will close on a sale by the end of June. According to Hilco Global spokesman Gary Epstein, the development team will strive to preserve historically significant details on the South Boston Power Plant site. A Massachusetts Department of Environmental Protection currently prohibits residential construction on part of the site; however, with additional cleanup, residential construction could be permitted. More information about the South Boston Power Plant site is posted below. Local developer Redgate is developing residential buildings including West of Chestnut in Quincy and One North of Boston in Chelsea. Redgate is also a development partner for pharmaceutical buildings including 75|125 Binney and 610 Main Street in Kendall Square. Hilco Global specializes in redeveloping "obsolete industrial sites" and is currently leading the transformation of a 3,400 acre Baltimore steel plant site into a logistics center. Former Boston Edison power plant listed for sale. Owner Exelon Corporation has listed South Boston's former Boston Edison power plant site for sale. The site is located at First and Summer streets in South Boston. Sources familiar with the sale report that at least six developers have bid on the site. Furthermore, it is likely the site would be developed into a mixed-use development project with both residential and commercial space. Exelon Corporation hopes to close a sale for the site this year. More information about the property is posted below.